Spikes gain most of their notoriety from track and field events as shoes that give runners extra traction. Different from the cleats commonly seen in sports such as soccer and football, spike shoes use removable metal or plastic spikes on the bases -- cleats typically have molded, permanent nodules on the bottoms. The idea behind spikes is that extra traction equals faster running, but the trick isn't only in the grip. The main benefit to wearing running spikes is that they grip the track better, giving you traction even in wet or otherwise harsh conditions. A variety of spike types exist. Smaller, sharper spikes, such as metal needle spikes, often work on standard tracks for short distances. Cross-country spikes are larger and a bit heavier, designed to last longer over more difficult terrain. They both provide the same benefit -- the better your feet grab the track or trail, the faster you can propel yourself. Spike shoes help you run faster by being versatile. Because they're removable, you can change the configuration to meet your needs, depending on what kind of race you're in. For example, sprinters typically put the spikes under the toes, where they spend most of their time in a sprint. Those who need all the traction they can get in a few tight turns, such as in the 200-meter race, might line the inside of the left foot and the outside of the right foot with spikes. Cross-country runners can get the speed they need spacing the spikes all over the shoe bottoms. Traction isn't the only way to increase speed. Spike shoes tend to be lighter than other types of running shoes, and the lighter weight means you can pick up your feet faster without as much fatigue. The weight of spike shoes varies; sprint spikes, for example, are the lightest, because the runners only have a few seconds and need all the speed they can find. This low weight has a tradeoff -- most spike shoes have little to no padding or cushioning and aren't designed for true comfort. They should fit well and not leave blisters, but they won't feel good after a long day on your feet. They are meant solely for use during races. Although spikes can help you run faster, they have their drawbacks. The removable spikes wear out, which means you must spend money to replace them. The lightweight shoes aren't designed for long-term wear, so they need replacing more often than standard running shoes. 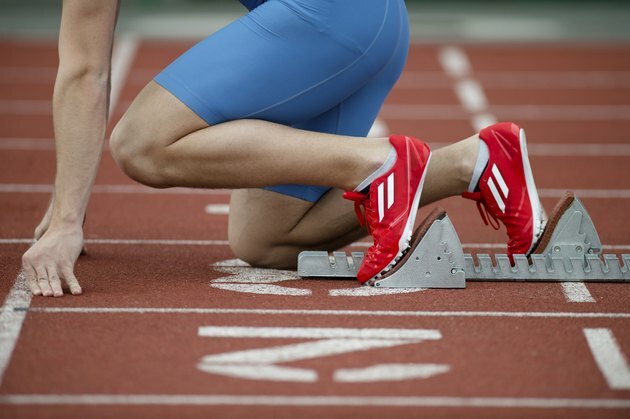 Practicing in your spikes wears them out faster, so consider using alternate running shoes except on race days. What Is the Difference Between Track Spikes & Cross-Country Spikes? What Kind of Shoes Should a 14-Year-Old Cross-Country Runner Wear?